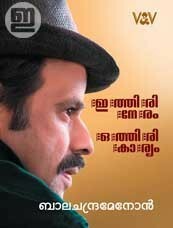 Ithiri Neram Othiri Karyam by Balachandra Menon gives us an insight into his life and experience of 36 years in cinema industry. In his words, the book could be considered as a nostalgic journey or as a confession. 'Ithiri Neram Othiri Karyam' which is filled with knowledge and entertainment, could also serve of the purpose of a guide to those who learn cinema. The book gives us a perception of Menon's experiences as well as the flaws he had experienced while handling story, screenplay, direction and acting. Fine compilation of speeches by ace film director-actor-screenwriter Balachandra Menon. ‘Ente ‘Adhika’ Prasangangal’ has 18 unique speeches wrapped with laughter and thought. This edition has multicolour photographs too.